This Week In Basketball: The Overture Has Been Played! With one week remaining in the boys regular season – and girls’ sectionals starting this week – things really boil down to just a couple of games that bear watching…for league considerations, and pride! We mentioned a week or so ago that inevitably, when February arrives, the basketball season petty much narrows down the like the neck of a bottle. By the time the early-season pretenders are gone. Now, it’s the contenders for those choice few games that will determine the league champion…or wait for the tournament. Sadly, there’s not enough of the former, and probably too many of the latter. I’ve always been an advocate of a requisite number of wins in order to qualify for the basketball tournament, like they do in football. It saves on the first-round blowouts, like the Chaminade-Belmont score that Joe Neves and I witnessed a few years ago. The final: Chaminade 84, Belmont 8. It was gripping stuff. But this week it’s principally about two games that compel people to either go in person, or read about it on Press Pros. One…in Division III, the Versailles Tigers and Marion Local (Marion is Division IV) meeting up for shares of the MAC. Versailles appeared to have the edge on the field going into last Friday’s game with St. Henry, clean in league play at 6-0 while St. Hank stood at 5-1. When the dust cleared they were both 6-1, and tied (as one person wrote to point out) for second, behind Marion, who beat St. John’s on Friday to go to 6-0. Well, Monday they meet – Marion and Versailles – to decide if the Flyers can win the league outright, because if Marion wins they have the inside track. If Versailles wins there’ll be a three-way tie for first between Marion, Versailles, and St. Henry. There are a couple of games left, of course, on all three’s schedule, but the serious lifting, as they say, would appear to be done as to the league title outcome. And by the way, all three of these teams – Marion (14-4, 6-0), Versailles (16-3, 6-1), and St. Henry (17-3, 6-1) – portend to be ‘contenders’ with the upcoming tournament seedings. Wyatt Bensman (above) and Anna did what a month ago no one thought possible…they beat Ft. Loramie twice! 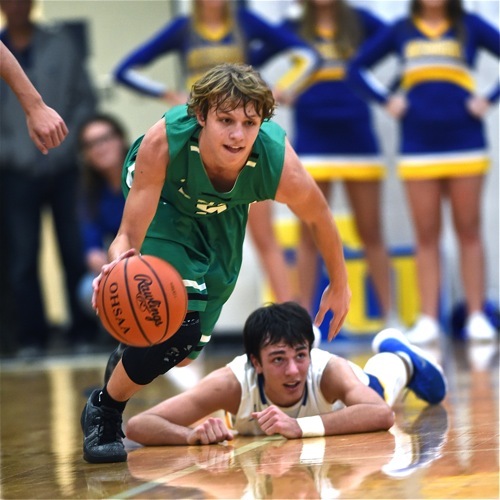 Marion and St. Henry are going to be a tough out for a lot of people in Division IV…because they play defense, first and foremost, and feast on turnovers and points in transition as their edge. And both have enough in perimeter shooting that on a given night they can blow someone out. They’ve both done it this year…and both have had it done to them. Versailles, of course, has the added weapon of Justin Ahrens, who averages in the 20s, put up 41 last week on Division I Butler, but lost in double overtime…because Ahrens fouled out and there wasn’t enough bullets left in the gun. But while he’s on the court the Ohio State recruit is electric to watch. When he’s on he’s pure ‘220’ (volts). 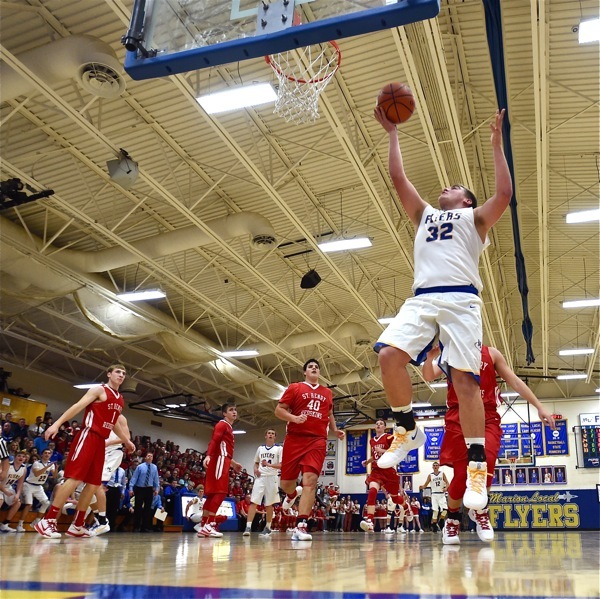 Monday’s game is at Marion, one of the toughest environments in Ohio high school basketball – small, loud, and claustrophobic…adding to the electricity. One might say, it’ll be ‘220’ versus ‘220’. And a seat will be hard – really hard – to come by. The other game of boys note will be this week’s Shelby County League conclusion between Loramie and neighboring Russia. Loramie, just three weeks ago, was unbeaten and ranked #1 in the state. 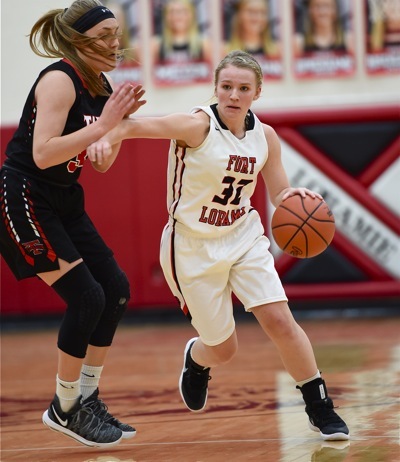 Since, they’ve played Anna twice, and lost twice, the most recent coming Saturday night when both teams were a bit hobbled – in particular…Loramie. The Redskins (19-2, 9-2 in SCL) were missing center Tyler Siegel with the flu (he wasn’t even there), and guard Evan Berning was playing through the flu, and obviously wasn’t himself. Anna took advantage, leading by as much as 10 throughout the second half, but eventually won by four points, 59-55. Russia, by the way, has the distinction of having beaten Anna twice, sits now with a record of 12-6 (9-1 in SCL), and if they can beat Loramie on Friday (the 16th) they’ll force the ultimate ‘kiss-your-sister’ outcome regarding who wins that league. If Loramie wins over Russia it will create a three-way tie between Anna, Russia, and Loramie. If Russia wins that game the title belongs to the Raiders, outright. And outright really matters in the basketball-crazy Shelby County League. Loramie’s Hattie Meyer and the Redskins enjoy yet another #1 seed in the Division IV Sidney sectional. In the GWOC North it boils down to Butler (18-2, 11-2) this week, versus Sidney (14-6, 10-3). That game will be played Tuesday at Sidney, and if the Aviators win they take it all. If Sidney wins, they split. In girls play, the hay’s in the barn as far as regular season records. Loramie, Minster, Versailles (Div. III), and Tipp (Div. II) are all #1-seeds, and open play later this week. For a full schedule of who plays, and where they play, we suggest you use the www.SWDAB.org website (southwest district board) as your go-to source. Locally, the Division IV sectional at Sidney will feature Loramie and Russia as the #1 and #2 seeds, respectively. While Tipp will open play at Tecumseh, and Versailles will play its sectional games at Covington. In about 900 words that’s how the bottle of the neck looks this week. The overture to the opera has been played; and the time is nigh to see who takes the bows when the curtain falls. Pick a game and go see for yourself. Or, read about it on Press Pros if you’re home with the flu. We’ll be there.